Clever Ikea and Container Store storage solutions are nothing new. Here’s a “bachelor chifferobe” from 1912. This single piece of furniture aims to provide the gentleman storage for everything he might need, as well as a writing desk! And “of course, a woman can use it too” according to the copywriter. Good to know. 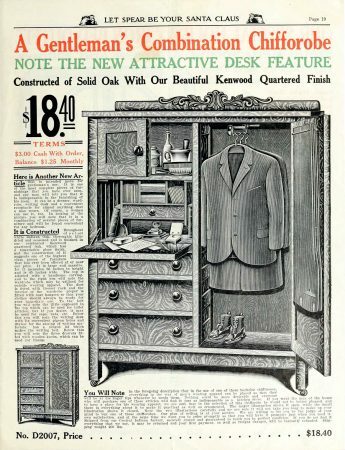 Wikipedia defines a Chifferobe as a “closet-like piece of furniture that combines a long space for hanging clothes with a chest of drawers” https://en.wikipedia.org/wiki/Chifforobe. Truly a piece of furniture which was “just as indispensable as a kitchen stove” (an odd comparison, but it makes the point). Click the image to zoom in on the lovely etching and loads of copy. Chifferobes were quite the hot furniture concept during the 2nd decade of the 20th century, when rooms and houses were smaller. In contrast, modern luxury homes often have bedroom “closets” (the term seems inadequate) whose square footage alone exceeds the average whole-house size of 1920 (which totalled just over 1000 square feet).